The Living Legend football world from Argentina in the '80s he was Diego Armando Maradona was born October 30, 1960 in the city of Buenos Aires Argentina. Maradona in field position as a Supporting Striker and Attacking Midfielder. Maradona was an idol in the Argentine society. But it was not just Argentina World also admitted he was a creature of the planet that has a typical dance while in the field. His debut began in 1976 with the club Argentinos Juniors. A year later, he made his international debut with the national team of Argentina. In 1981, he bought the club Boca Juniors for £ 1 million. That first year he went on to present trophies joining Boca Juniors for the Campeonato Metropolitano. 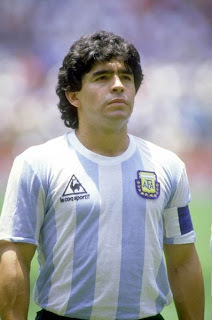 Maradona then transferred to SSC Napoli in 1984 and brought the team won the Serie A for the first time in the history of Napoli (1986/87 and then 1989/1990). In addition, he also helped Napoli won the Italian Cup in 1987. A year later (season 88/89), Napoli beat Stuttgart to win the UEFA Cup. Shows the greatness Maradona was at the time of the 1986 World Cup in Mexico, where Argentina out as World Champion for the second time, after the first in 1978 in Argentina. At the World Cup in Mexico, Maradona makes the best goals of all time is when Argentina against England in the quarter-finals. At that time, Maradona dribbled from midfield, then passed 5 English players and conquer the famous English goalkeeper, Peter Shilton. Unfortunately, the party anyway, Maradona made a very bad goal anyway. Goals are created with the help of hand, says Maradona as a result of the help of the "hand of God". He finally admitted that it was done intentionally on August 22, 2005. At the next World Cup in 1990 in Italy, Maradona managed to bring Argentina to be finalists after beating host Italy in the semi-finals. Unfortunately at the top of the party, Argentina defeated by West Germany with a score of 1-0. His career then climbed down after that. He was found guilty of doping in 1991 and banned for 15 months. Once free, he made his comeback with Sevilla, but was fired a year later. He then returned to Argentina and play with Newell's Old Boys for 5 games before once again banned for 15 months for doping to be known as the 1994 World Cup takes place. After being a coach for Deportivo Mandiyú (1994) and Racing Club (1995) and tried to resume playing career with Boca between 1995 and 1997, he finally retired in October 30, 1997. In 2004, Maradona was near death from a heart attack due to cocaine overdose. After discharge from the hospital, he had abdominal surgery in March 2005 to reduce the weight. In August 2005, he started a new career as a talk show host. In 2008, Maradona was surprisingly elected as the head coach of the Argentine national team. And, in his debut as the new coach Tim Tango, Maradona managed to bring his team to subvert Scotland 1-0 in Glasgow. Maradona also named Maxi Rodriguez, Atletico Madrid midfielder as the new captain of the national team. Maradona now serves as coach of the Argentine national team.